The addition of the DeHydrator System to Somat Company’s line of waste reduction equipment marks the first step in shifting product line focus from simply reducing waste stream volume destined for the dumpster to landfill diversion and sustainable use. In recent years the measure of equipment efficiency ranging from the auto industry to power generation is quantified in terms of “Carbon Footprint.” In an effort to reduce a product’s impact on the environment, manufacturers evaluate the environmental implications of a product throughout its lifecycle, from raw materials and assembly to operation and disposal. In the latest attempt to cut waste, Somat Engineers focused on reducing the carbon footprint of the DeHydrator System line of products in several aspects from components to machine operation. The first step in improving the environmental stewardship of the DeHydrator System was to reduce the carbon footprint created by the manufacturing process. The attraction of significant cost savings is ultimately responsible for the recent relocation of several household name manufacturers to foreign soil. The outdated energy-laden manufacturing processes and transportation of parts across the ocean can be held equally responsible for increasing a product’s environmental impact. 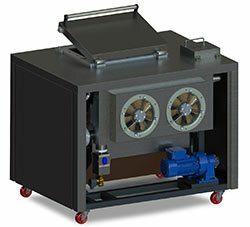 Somat Engineering and Purchasing joined efforts to source a number of DeHydrator System components with stateside manufacturers. As a result, Somat is proud to announce that effective August 2011; the DeHydrator System line of products will be assembled in the United States at the Lancaster Pennsylvania-based facility. In this phase of transitioning assembly to the U.S., all mechanical drive and electrical controls for the DeHydrator System will be purchased and assembled within the Union. Assembly of the electrical components at the Somat factory means that new DeHydrator Systems will boast a UL listed control panel. The switch to domestic components not only reduces the amount of energy required to produce a DeHydrator System but also ensures a customer that their potential investment will keep Americans working. The PLC controls coupled with a touch screen allows for custom-tailored DeHydrator System operation based on the customers’ needs. In addition to providing a wide range of operational adjustability, the DeHydrator System is now equipped with Somat’s patent pending “dryness sensing technology.” The new system monitors the rate of dehydration by observing the amount of time it takes the system to remove a predetermined volume of water from the waste material. The time interval is monitored throughout the entire cycle and compared to set threshold interval in the PLC. Once the threshold interval is exceeded, the material is determined dry, and the DeHydrator System begins to cool the chamber for discharge. The time threshold is also fully adjustable to meet the customers’ dryness requirements. More importantly, the DeHydrator System cycle time and power consumption is now fully dependent on the amount of material being processed. In addition to improving operation and efficiency, the new DeHydrator System is outfitted with an automatic lubrication system for the agitation shaft; this corrects a weakness in the design that had led to early bearing failures and also makes the unit almost maintenance free. Lubrication intervals can be set on an application basis and only require a technician to replace the grease cartridge when empty. Average lifespan of the grease cartridge is 18 months.